Many of my outdoorsy friends rank this as their favorite hike on Mt. Hood and make it an annual pilgrimage. The views are outstanding and while there is a decent amount of elevation gain, there are numerous places to stop and enjoy the view on the way up. The standard summer route is to start from Top Spur Trailhead and head up the Timberline Trail all the way to the McNeil Point Trail turnoff. For those looking for a bit more mileage, you can start from Lolo Pass and add a couple miles on the Pacific Crest Trail. And, if you want a solid sweat, there is an unmaintained spur trail—known unofficially as the climbers trail—that heads off the main trail and gives you a strenuous climb directly up the ridge to McNeil Point. Lots of options. While this is primarily a summer and autumn hike, Lolo Pass is low enough that serious adventurers will head up even in winter. The road can be snowy and icy, so snow tires or chains are a must. Also, McNeil Point is above 6,000' feet and you will cross a couple of steep slopes, so boots are required and crampons may be a wise choice. Dress warmly too, the mountain weather can definitely be a bit harsh in winter. Northwest Forest Pass is required at both trailheads. Thankfully, the ZigZag Ranger Station (map) is located at the bottom of Lolo Pass Road and opens at 8am, so you can pick one up on the way. Year-round, with caveats. The Lolo Pass Trailhead is at 3,415 feet and the Top Spur Trailhead is at 3,900 feet, so the road may be impassable for cars between December and April because of snow. A call to the ZigZag Ranger Station is recommended during the winter months to check on conditions. Drive to Lolo Pass, Oregon (map). Immediately before reaching the top of Lolo Pass is Forest Service Road 1828. Take a right onto Road 1828 and go 3 miles to the junction with gravel Road 118. Take a sharp left onto Road 118 and follow for 1.6 miles to the Top Spur Trailhead. Drive to Lolo Pass, Oregon (map). You can park on the side of the road at Lolo Pass or if you go about 10 meters past the top of the pass you can take a right onto Forest Service Road 1810. Immediately after the turn is parking for six vehicles. From the Top Spur Trailhead, you head upwards for half a mile and then take a right onto the Pacific Crest Trail. A very short way on, you reach a junction with four different trails near a large sign where you can fill out your Wilderness Permit. Your best option is to take the Timberline Trail up and to the right of the sign. This will have you going gently upwards through dense forest until you reach the wide view of Bald Mountain. Far below the trail is the Muddy River and up ahead should be a truly stellar view of Mt. Hood. Continue on the trail until you enter the forest again. You should soon reach a sign indicating a "Cut Off Trail" that goes up and over the ridge to your left. Take it. It is only 0.1 miles. On the other side of the ridge, take a right and begin a moderate ascent up and through the forest on the Timberline Trail. You will pass the turnoff for the McGee Creek Trail and continue upwards. In a little over a mile you will come out of the forest into a wide open meadow with excellent views. Often you will see groups here taking breaks or having lunch. Continue past this meadow area and you head downhill a short distance before climbing up a few switchbacks. At the top of the fourth and last switchback (heading northwards), there will be a faint track that goes to the right and into the brush. If the trail conditions are good and you want a more challenging hike, this is the climbers trail and provides a steep and challenging route up to McNeil Point. If there is any snow or ice on the main trail, the climbers trail is not recommended as it can be dangerous in bad conditions. Follow the climbers trail through a bit of woods and then onto the ridge line. In a few parts it is a scramble and you may have to use your hands. At the very end you go up rocks and through shrubby trees, McNeil Point shelter will be immediately in front of you. For the return trip, you will follow the trail that heads northward from the shelter. In a couple hundred meters (and a bit of uphill), you will reach the first of two scree fields. This area can be dicey when there is snow so be careful and do not rush. In a quarter mile you will reach McGee Creek, which has chilly but tasty water for you. Continue on through a meadow area that has stunted alpine trees. The trail can be a bit narrow thanks to the trees but you can maneuver around them reasonably well. Roughly 0.7 miles from McNeil Point Shelter you will reconnect with the Timberline Trail on a ridge above a stream. Head down the ridge and back into the forest. Continue following this trail past the turnoff for Mazama Trail #625, down a couple switchbacks, past a couple small lakes, crossing two creeks (one near a very pretty waterfall), and in about a mile from where you joined the ridge you will be back at the turn off for the climbers trail. Continue back down the way you came up. At the top of the switchbacks continue on the main trail. 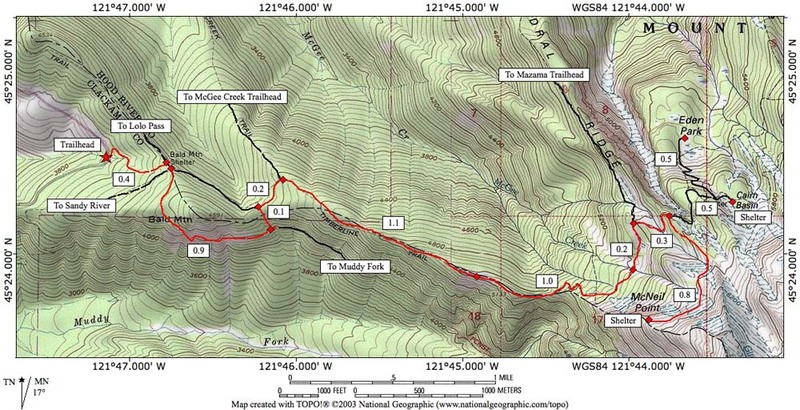 You will cross two creeks (one with a rather pleasant waterfall), hike past two small lakes, head up a couple switchbacks, and then reach the turnoff for Mazama Trail #625. Continue on the Timberline Trail up the ridge and you will soon reach the McNeil Point turnoff that goes to the right. Take the McNeil Point Trail. It becomes pretty narrow and winds through some stunted trees. You will soon reach a meadow area and cross McGee Creek, which typically has some cold, tasty water for you to drink. Continue on and cross two scree fields that are fairly steep and can be a bit dicey in winter without crampons. After the rock fields, the trail will head downwards and then you will reach the flatter area where you will find McNeil Point Shelter. Enjoy the views and have a snack. Return the way you came. This is a longer approach to McNeil Point but if there is snow or ice on Lolo Pass Road, you may not want to drive the narrow and steep road to Top Spur Trailhead. From Lolo Pass, head south on the Pacific Crest Trail. After half a mile, you climb a series of long switchbacks. The switchbacks are only a mile long and then you proceed along a ridgeline. Approximately 2.5 miles from Lolo Pass you will see the junction with the Top Spur Trail. Continue up along the Pacific Crest Trail and now follow the instructions for the Top Spur Route above. There is a trail continuing up the ridge past the McNeil Point Shelter that you may wish to explore and the Sandy Glacier Ice Caves may be an option if conditions are good and you have the relevant experience.